Breeding and raising canaries is not a simple process, but hatching is fairly simple and natural. By providing the ideal conditions and maintaining a healthy environment for your canaries, hatchlings will thrive to become beautiful and happy adult canaries. Canaries are normally not very social domestic birds, but you can bring males and females together in the spring for breeding. After breeding, the female canary will lay up to eight blue eggs, though five is more typical. After she has laid the last egg, the female will sit on her eggs for about two weeks. Fourteen days after the female begins sitting on the eggs, the canaries will be developed enough to hatch. Baby canaries break out of their shells without assistance and are born featherless and sightless. They depend completely on their mother for food and shelter. Before and after hatching, the bird cage ought to be kept clean and out of the way of drafts. The mother may appreciate having a water bath nearby. It will keep her feathers clean and also provide good moisture for the eggs to aid the hatching process. Ideal breeding temperature is around 70 degrees Fahrenheit, and the cage should be kept around that temperature throughout the incubation and hatching. Baby canaries are normally independent from their parents by the time they are 31 days old. Between hatching and maturity, the canaries should be kept separate from adults besides their mother. 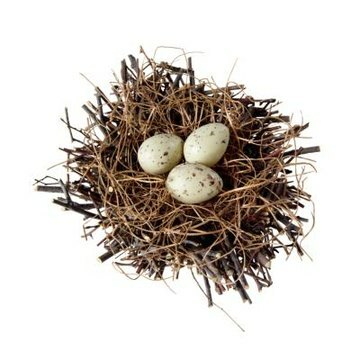 Keep the bedding under the nest clean, as the baby canaries will eliminate on or just over the edge of the nest.